This machine can be used for in-line and off-line coatings. It can be a replacement for the conventional coating machine or can be newly installed as it can handle functional coatings with enhanced operability and coating performance. The extensible control system is adopted to allow a remote operation using a computer. The following can be installed with options: an automatic pressure control machine, wet coating thickness measuring machine, and atmospheric plasma machine. Coating test can be conducted in a lab. 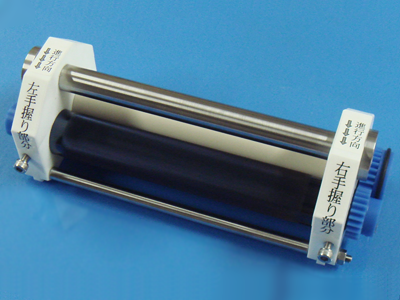 Line speed can be adjusted due to a characteristic of coating liquid. Thin base materials can be also coated stably. This structure can be applied to "roll-to-roll" coating. We can fabricate manual coating machine that provides the same features as those for the regular coating machine.